What are the benefits that you get from a PSYCHIC READING? Tarot cards are mostly known and used as a tool for divination. They offer predictions presented as a field of potential and possibilities. The Tarot has the ability to point the inquirer towards the answers that lay within themselves giving the clarity to handle life situations. I like to use the Tarot as a spiritual book that no matter which page I open, it gives me an uplifting message to assist me in my own expansion of consciousness. Being in the present moment allows you to experience a deep connection with your Soul which embrace you in sublime consciousness. Everything that is in this reality changes. Body, people, jobs, relationships, health you get the point. The reality that we call life is about changes. If there is one thing that we can be certain is that things are going to change. During our life experience we face those changes and learn to navigate through them. Those changes force us to make decisions. During changes remember of the opportunity to stretch your awareness. As souls, we incarnate in a body to have physical experiences assisting the awakening of our Higher Self. Moving through your life journey with an open mind, the Tarot assists us to adjust our approach, to look for different ways with flexibility and acceptance. It is by being fully conscious in the present moment that one can receive the guidance of the Tarot cards. 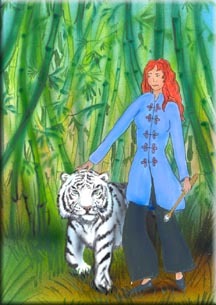 Your psychic reading will be delivered in harmony with the essence of the reader. What does it means? It means to choose well the person you will be sitting with. Ask yourself: is the reader someone who inspires me? Can you be vulnerable and personal with this person? Do you have expectations? What is the purpose of this reading? Being clear, open and receptive will allow you to receive more from your psychic reading. Steer clear from pre-concept idea of how the reading should go. ♥ Eliminate anxiety caused by changes. ♥ Clarity about your decisions and directions. ♥ Inspiration from your Soul ~ Spirit Connection. Psychic readings nourish your Higher Self and give a voice to your highest potential. It illuminates your life path with the clarity to see the possibilities available to you. It inspires you in trusting yourself to make beneficial decisions. It empowers you in taking leaps of faith to manifest your intentions. WHO BENEFITS MOST FROM A READING? ♥ Would it be beneficial for you to receive clear guidance? ♥Are you second guessing yourself creating conflict in your intentions? ♥Are you ready to clear old stories and gain insight into what is keeping you locked in the same patterns? ♥Would you like to expand your consciousness and focus on your intentions? ♥Would you like to be infused with trust regarding your potential and possibilities? ♥Are you looking for clarity and inspiration to empower you in moving forward towards your objectives? ♥Would it be beneficial to have a mentor pointing you towards different perspectives to guide you through challenging times? ♥Are you ready to expand your consciousness and set your intentions to manifest your highest desires? ♥Would you benefit from a helping hand to reach your dreams and goals? IF YOU ANSWERED YES TO THESE QUESTIONS, I CAN HELP! I offer psychic reading to guide you through your life transformation. The spiritual guidance that you receive assist you to eliminate anxiety caused by changes.